If the postcards from Romsdalen are beautiful, the “real picture” is so much more dramatic. It is a real treasure with the deep fjords and sharp mountain peaks that rise from the water and up to the sky. (I would like to say clear blue sky, but there are actually not many clear blue skies in Norway at all). 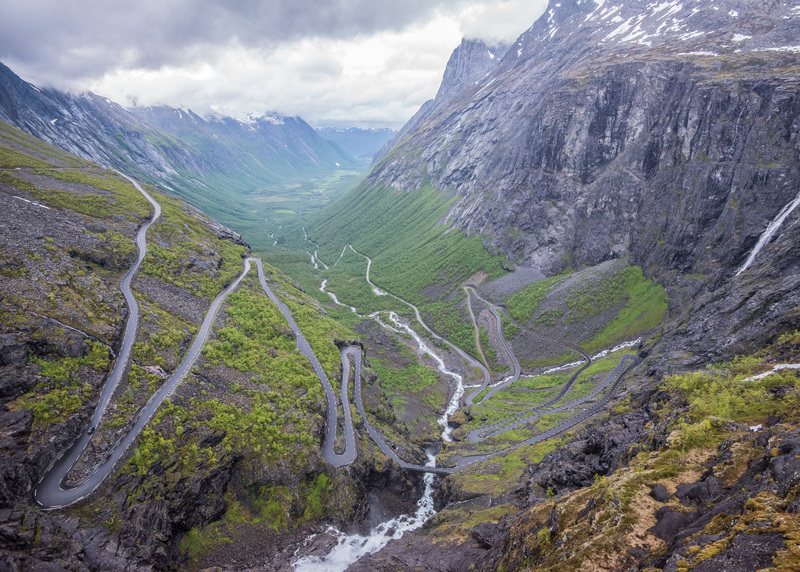 Anyway, most people who come to Romsdalen are motor-tourists who drives up and down the Trollstigen, a crazy road that lurches up in the mountains with a climb of 850 meters. 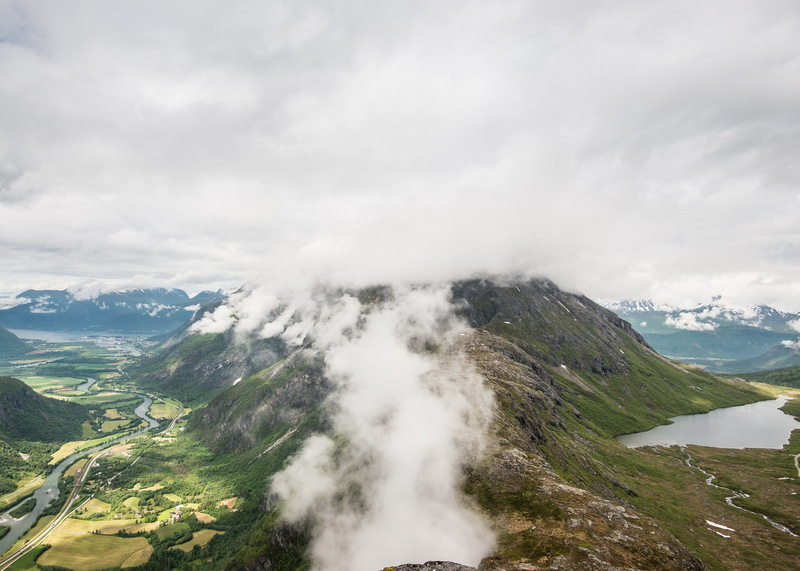 At the top of Trollstigen there is a popular tourist facility where you can look out over the valley below. This was also where I started my week in this mountaineering wonderland, overlooking not less than three of my upcoming climbs. Certainly there are many outdoor enthusiasts visiting this area for the same reason as me, but given how dramatically the landscape is and how easily accessible the adventurous mountains are, I am surprised that not more people open their car doors and step out and into the wilderness. In seven days, my goal was to climb: Store Vengetind, Store Trolltind, Kvanndalstind, Juratind, Kungen, Drottningen and Romsdalshorn. The order of the peaks, I had carefully laid out so that I would obtain valuable experience along the way, because experience was really what I was lacking! 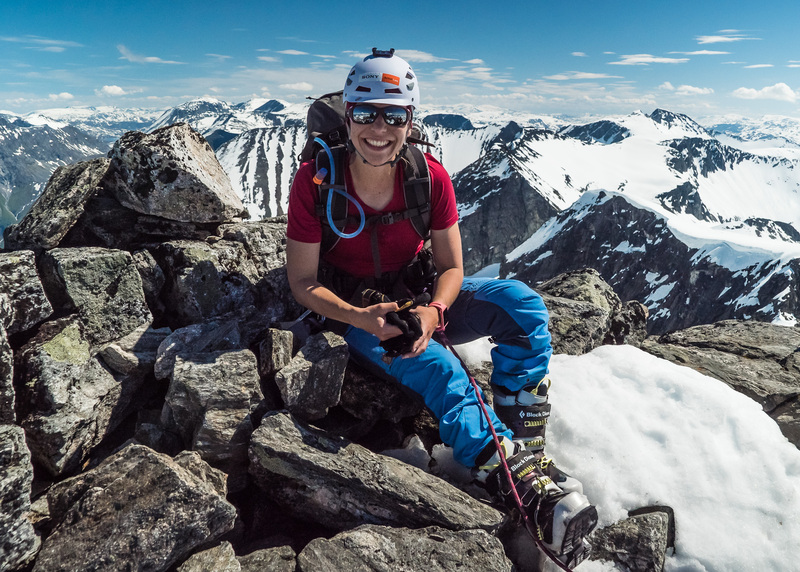 My journey started about three years earlier, when I saw a documentary on TV where the journalist climbed seven peaks in Romsdalen and was rewarded as Mountain Queen. It was like a spell. At that moment I knew I wanted to do the same journey. I just had one problem, I had never in my life climbed before. So my dream was sort of put on hold for a few years. But as a new year resolution 2014/2015 I decided, I want to become a Mountain Queen! I soon realised there were no other Swedish girls with the reward and that really helped me to get going. I started to practice climbing at my local climbing club in Stockholm. This was really a new world for me. I have been canoeing for almost all my life, a safe world for me. But now I was anything but comfortable. At the same time, being a beginner is not only scary, it’s also really something good. You get to ask all the stupid questions and the best, every time in the climbing hall you get to feel the improvements. That feeling is for sure something that pushes me forward and made me realize I should not be so afraid of trying new things. Anyways I had about 6 months to prepare myself, from a flat footed paddler to a gracious climber. At least I had one thing that was speaking for my advantage, I’m not afraid of heights. From early June, I had been looking daily at the weather reports. Usually, the mountain area is free from snow by the end of June when I was going to climb the seven mountains. But this year, the winter left extremely late and almost all the peaks were still covered in deep snow. I had been so focused to get myself ready for the climb, but evaluation of avalanches was definitely not on my to do list for this summer climb and now I was stressing that this might be the one thing that could stop me. When I arrived to Romsdalen and realized exactly how much snow it was I actually did not think I was going to be able to even start my adventure. I was sinking and sliding through the soft snow and my confidence was sinking to the bottom of my shoes along with my vision of joining the “Royal Family”. At that moment I felt, being member of the Royal family would be easier to achieve by marring a prince. Juratind – the first of the seven peaks. To calm my nerves, I went to see Halvor Hagen a local guy who was going to climb with me. What Halvor doesn’t know about this area is probably not worth knowing and Halvor had a solution. He just said, it’s no problem, just bring your skis. 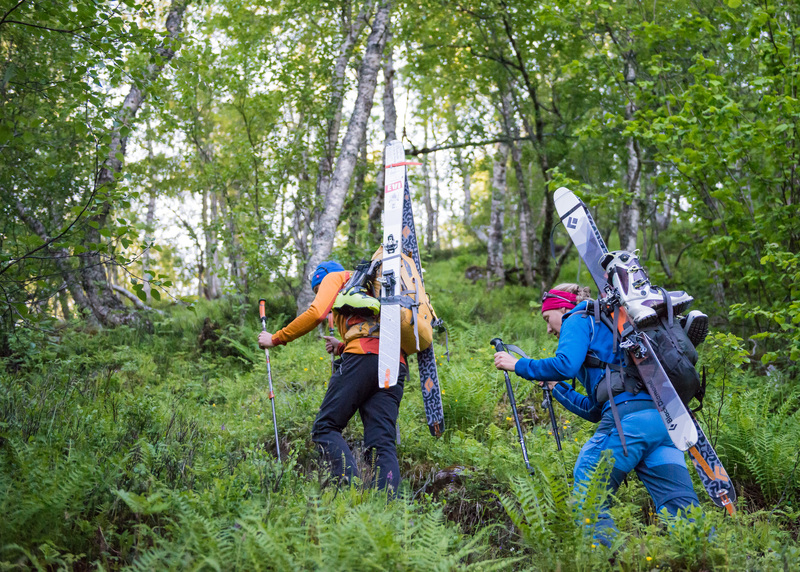 Yes, my skis… There is another thing I will add to my list when going for a summer adventure. On the 28th of June, I went to find a pair of skis and the following morning Halvor and I was ready for the first peak, Juratind. The order in which we climbed the peaks was from this day totally based on the weather and more specifically the snow. But this day, wow. When we finally reached the top and got that view. I quickly forgot how tired my legs were from skiing and climbing in skiing boots. On the top, I could read in the “top book” that no one had been there since October the year before. To ski down the mountain in the soft untouched snow was great. But I let Halvor ski in front of me not to let him know this too was a first for me. The following days was like a review of the four seasons. Anything from bright sunshine, snowfall, rain from everywhere and fog. The fog made me almost miss my target one day. That was also the day when I laid down on top of Trollväggen, the highest vertical wall in Europe (1000 m) to look down. Unfortunately, I only saw about 1 meter down because of the fog. I guess I have to do that at least one more time. One of my strongest memories are from the third day when I climbed Romsdalshorn. This was the peak I had been most worried about since it was the most technical climb. The original plan was to finish with this peak when I had gathered some more experience, but because of the weather conditions I had to take it this day. This also turned out to be the only snow-free peak all to my happiness. I really had to challenge myself for this climb, but the victory when I came to the top was so sweet. This was such a boost for me to carry on for the next 4 peaks even though my body was aching. By now my legs were looking like a Dalmatian, pale white full of black bruises. My will is obviously stronger than my technique, but hey it seems to work. Store Trolltind – the second peak. Romsdalshorn – nr. three and the most technical peak. Kongen & Dronninga – the first double. Kvanndalstind & Vengetind – finally, all seven peaks done! When I had 4 peaks to go, the weather started to change quite rapidly. It got a lot warmer and the snow was starting to melt quicker which made it a lot harder to walk and climb in. Halvor and I decided that we should try to take 2 peaks a day, so the last 4 peaks in 2 days. This would mean long days and hard work. On the fourth day we started off with “the King and Queen”. This is actually not a bad idea to combine since you are half way to Dronninga (the Queen) when you are on top of Kongen (the King). But this day it was all a big question if we would be able to continue towards Dronninga, since we had no idea if the planned route between the mountains was going to be good enough because of the snow. We made an attempt and succeeded! For every summit, I was getting closer to my dream! The morning on the fifth day we had to get going really early and waking up after too little sleep I had to dig deep into my mind to get my body moving at all. Off course it was worth it standing on top of Stora Juratind knowing I just had become a Mountain Queen! I had been struggling hard with the snow during the five days but on my way down from Stora Vengetind it was such a blessing. What had been about 10 h climbing upwards, took only an hour to get down. Once down in the valley I ended the day just like the other, a coffee and cake on the back of Halvors pick up truck. Today we had a royal coffee. This has been an amazing journey. For me, an adventure is when you set your mind on a goal that is hard to reach regardless on what level you are on. For me this was at time over the top difficult to reach and at times I had to push myself a lot harder than I thought I could manage. But that also proves that the goal was perfect and that also makes the feeling of victory so much stronger!